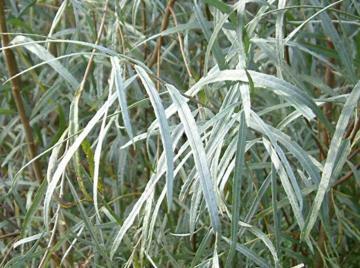 Small tree or large upright shrub with beautiful narrow silvery leaves, giving a delicate and graceful appearance. Fast growing. Prefers a damp, heavy soil in a sunny position but will succeed in most soils. Does not thrive well on chalk. By cuttings from young growth, which usually root quite easily. By seed sown as soon as it is ripe. In the wild it form thickets along esturies and watercourses.